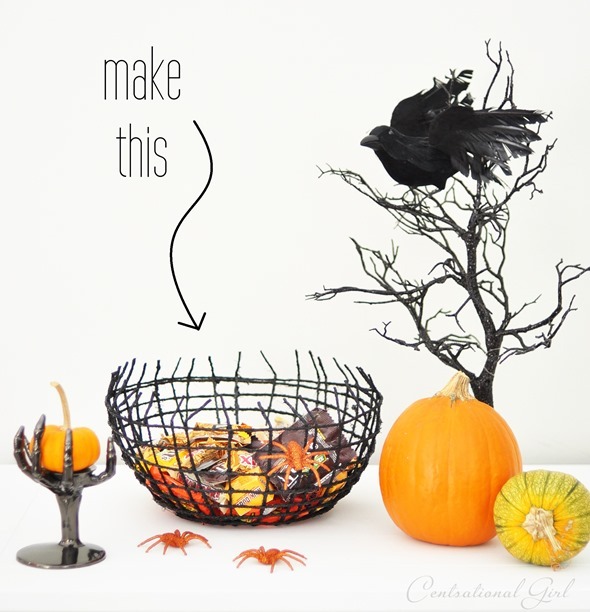 I am so exited to share this DIY Halloween Spider Bowl with you. My kids are all grown and out of the house, but I still remember the days when they use to look forward to doing a fun project for Halloween. I hate to admit it, but I was not one of those moms that would say “oh how cute ……. (fill in child’s name) even though in the back of my head I was thinking, “What the Heck….. and you want me to put that where??? ?” Nope! my poor kids got to hear the truth, that would often go something like this…..
Mommy: Oh sweetie I see where you where going with that. Did you have fun? ( usually followed by a yes)… okay great now why don’t you go ahead and decorate your room with that. Child: Mommy its for you or I want to put it on the entry table. Any who, this little project is one of those that you will not have to hide from your guest or lie to your children about how cute it is, it is easy and virtually ugly-proof, from one of my favorite blogs spots centsationalgirl . I attempted a similar bowl with yarn and wire last year but it was a total #craftfail. I approached it again with a different attitude turning to the tried and true glue plus water plus string formula that others have used in the past. 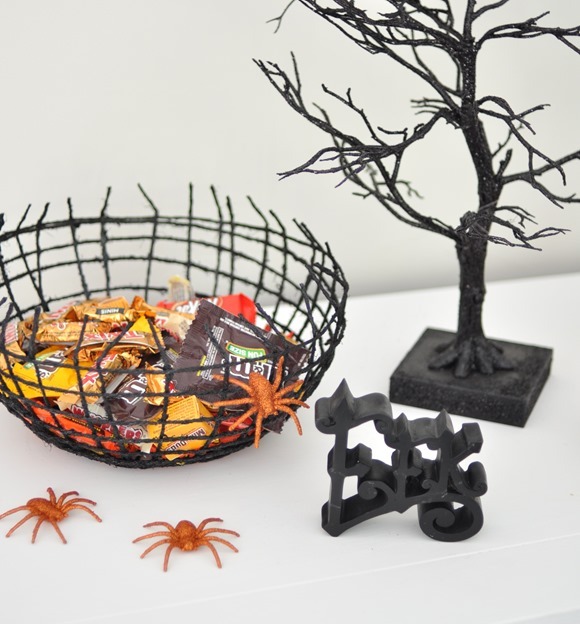 Great news, the method worked and as a result I constructed a clever yet creepy Halloween treat bowl inspired by one of our favorite Halloween motifs: the spiderweb. Remember all those DIY string ball pendant fixtures we were so wild about a few years ago? The ones that required you mix glue and water and dip your string and wrap it around a large plastic ball and then insert a pendant kit inside? This is basically the same idea. Without the lightbulb. 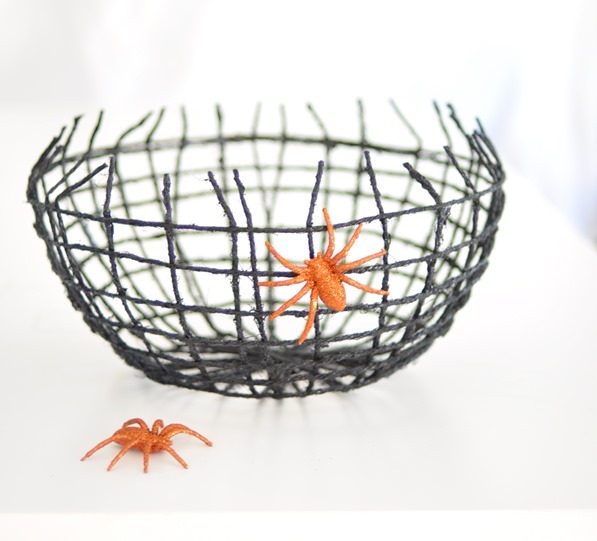 Want to create one of these spiderweb bowls? It’s pretty cheap and remarkably easy. I didn’t photograph the beginning steps because it involved the whole twine dipped in glue thing and I didn’t feel like pausing and rinsing and grabbing my Nikon just to snap an in process photo. But I think you’ll get the idea. 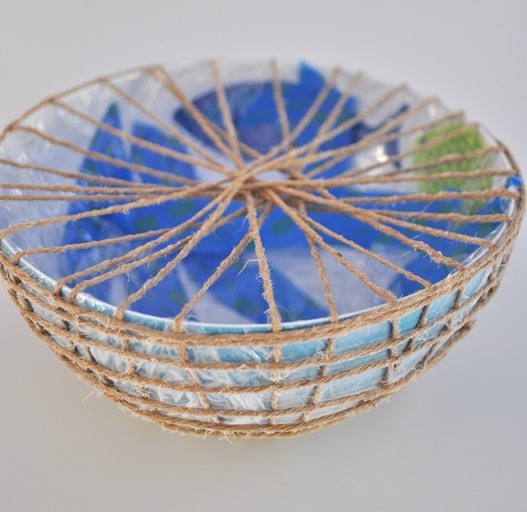 What you’ll need to recreate: large bowl, plastic wrap; painter’s tape; cheap vinyl tablecloth; craft glue; roll of jute twine (not too thin); spray adhesive; scissors, and spray paint. This was the closest I got to an in process shot. Yes that is a vinyl tablecloth stretched over my kitchen island and some watered down tacky glue and also the twine around a bowl. Warning: this step is messy. 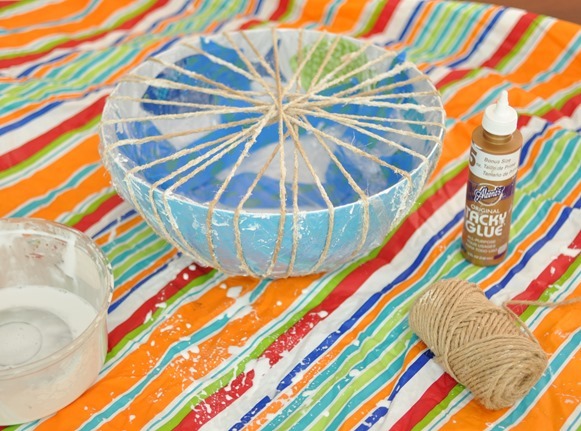 To start, wrap your large bowl in plastic wrap and secure it on the inside of the bowl with painter’s tape. Water down the glue by a 1:1 ratio and then dip the twine in it. (I squeezed most of the liquidish glue mixture off the twine before I wrapped it tightly around the bowl). 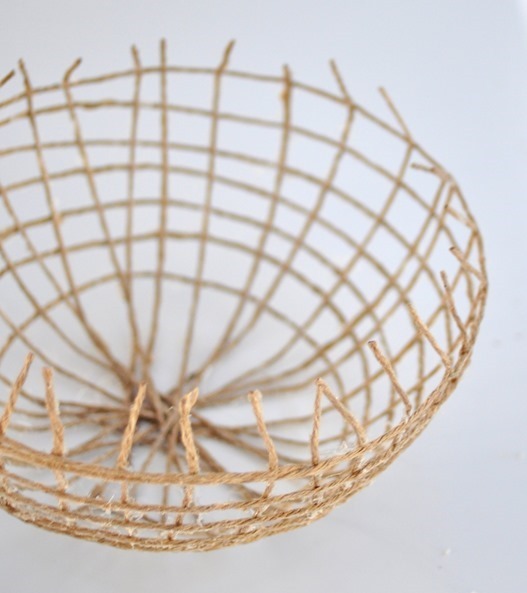 Start your end at the base of the bowl and wrap the vertical pattern in a spiral around the bowl leaving about an inch between each rotation and dipping the twine as you go. Take the bowl outside, turn it upside down (bottom of bowl facing up) and spray the entire bowl with spray adhesive. Allow to dry for 4 hours. Next, repeat the same steps wrapping the twine in a circular pattern around the sides of the bowl to form the horizontal pattern. Coat with spray adhesive and allow to dry another 4 hours. This is how it looks when it’s all dry with both layers of twine. This may be the moment where you question whether this is ever going to work. Oh yee of little faith! 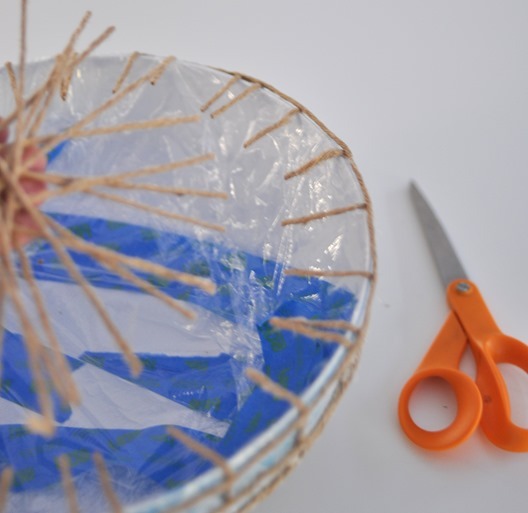 Carefully clip out the center twine spokes with scissors and remove the painter’s tape inside (just cut it away). 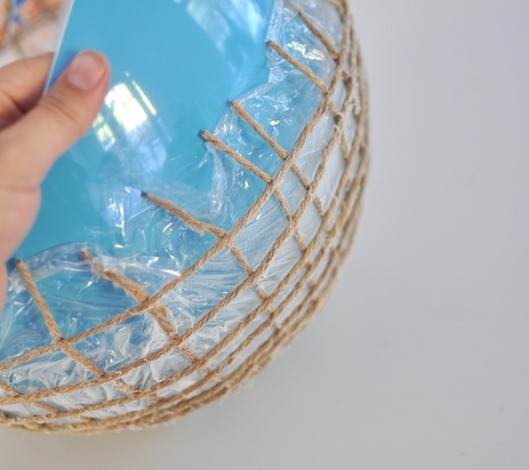 Slowly remove the bowl away from the twine bowl shape, then peel away the plastic wrap. At this point you can let out a little squeal because OMG you made a twine bowl that could hold stuff like all your other rolls of twine. Or yarn. Or bungee jump cord. You could trim the upper edges of twine down but since this is for Halloween I left them alone and spikey and then spray painted the entire thing black (two coats) which I’d like to think makes it stronger because everyone knows spray paint has magic powers. And then I added orange spiders because black spiders are just … predictable. Actually I was shopping for little black spiders at CVS but they only had black rats and black rats don’t work with spiderweb bowls, but they did have orange spiders, so that’s what you get. In hindsight, the contrast is nice. Why I’m sharing that, I have no idea. 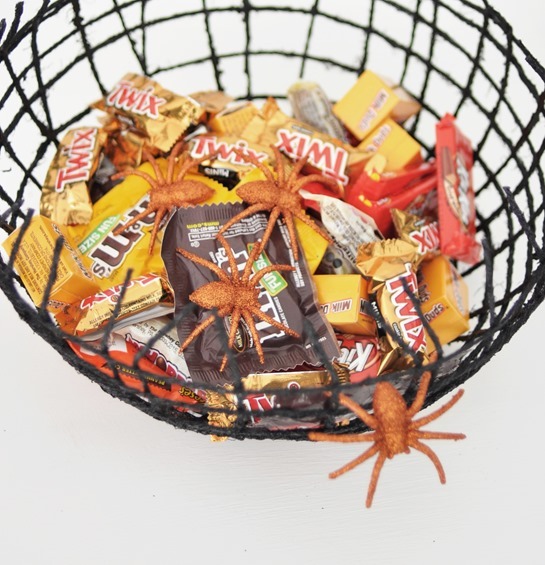 Random poll: what candy in what percentages makes the most perfect Halloween treat bowl? I’d argue Twix 25% M&Ms 25% Milk Duds15% Skittles15% (sadly missing) and then you’ve got to have about 10% of Almond Joy and 10% Snickers. I could do without the Whoppers (not a malt girl) and I say always go heavy on the chocolate in ratio to fruit flavor. Discuss. If you’re a lollipop person, you might want to create a tighter web just so the little suckers don’t fall out. 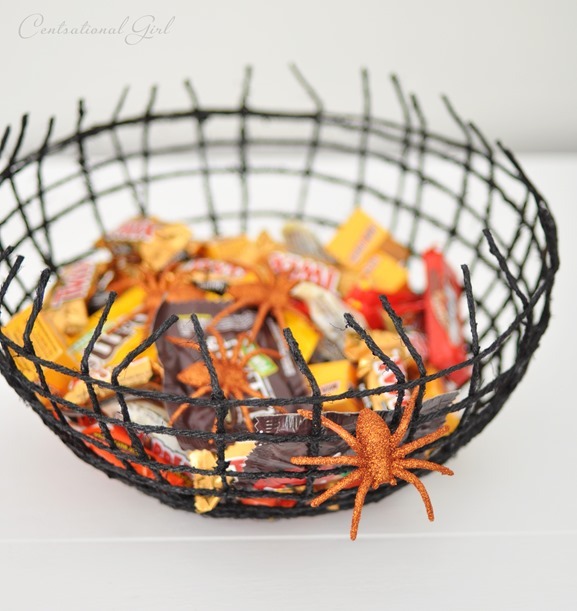 The bowl makes a practical yet creepy prop for a stash of candy or snacks at a party. Also perfect for zombie cheerleaders who are more than happy to hand out treats to visitors at the front door as long as they get to steal a few when you’re not looking. If you would like help decorating your home or you are searching for an interior designer in the Colleyville area, call MOD Interiors at 214 404 4000,or you can email us here MOD Interiors , we would love to help you. That is such a clever project! I’m not crafty at all. 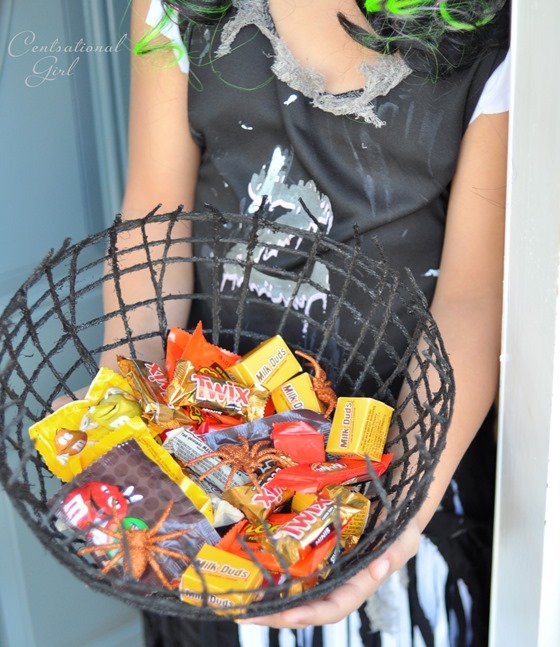 You did a great job and are ready for the trick or treaters. Hey, that’s cool! I may have to make one for tomorrow! I think my daughter would enjoy the process of making it! Thanks for sharing! I think she would Caroline. What a fun and easy project! 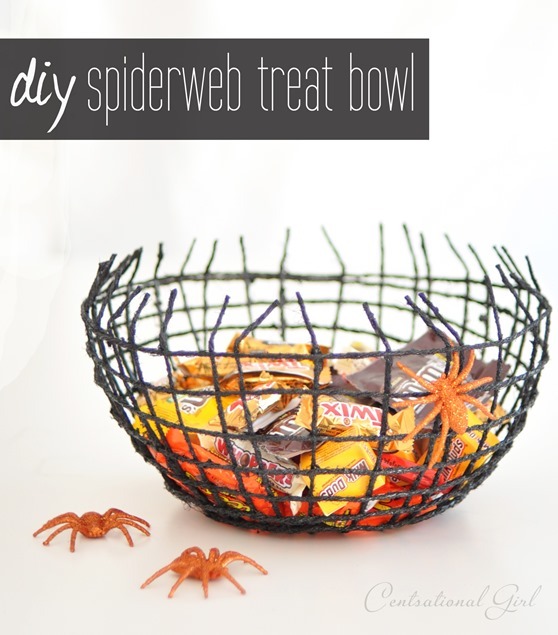 Love the spider Web bowl. Looks like a super easy and fun project. Very cool – would be a fun, kid-friendly project! Such a cute and simple project for the “sweetest” holiday ever! I bet she will love it Alicia, have a great mother/daughter time.